Hope Church spreads the gospel by impacting local towns and villages and then growing outwards into regions. 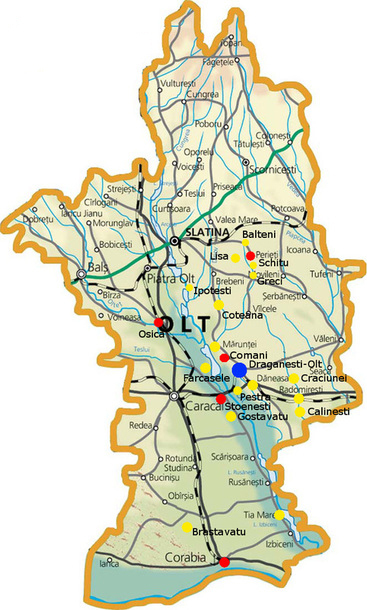 Presently, we are expanding into different districts throughout the Oltenia region. We are currently seeing great fruit from the evangelism being done in Olt County through Răspândind Evanghelia în Sudul judetului Olt (R.E.S.O.) Ministries, which translates to Spreading the Gospel in Southern Oltenia. We have started a similar base in Dolj County that operates under Răspândind Evanghelia în Dolj (R.E.D.) ministries, which translates to Spreading the Gospel in Dolj County. We estimate that our work in both areas will target approximately 1.2 million people. R.E.S.O. Ministries began in 2003 with a mission to spread the hope of Jesus Christ to the Oltenian district, starting in Draganesti. Working in the local towns and villages we created projects aimed at fulfilling the physical and spiritual needs of the people. A harvest began as a result, and we were able to plant Hope Church, which is now the base of our growing vision. What started as a calling to a small town has become a driving force for spreading the gospel and seeing thousands redeemed for the kingdom. Level I Ministry: This is the starting point of a future plant, including but not limited to a weekly kids club, bible study, or women's ministry meeting. Level II Ministry: This is a group that is legally recognized and meeting as a church. These churches have facilities but still rely on a mother church. Level III Ministry: These churches are self-sufficient and have the ability to plant and coordinate other churches. We plan to start an English Club to engage the thousands of college students living here. This will allow them to further their language comprehension while providing a window to share the gospel. Young adults who show an interest in the gospel will be invited to Bible studies, which will allow us to disciple and cast a vision for what it means to live for Christ daily. Once consistent Bible study groups are formed, we will extend them into home churches with more intentional community and fellowship. Here we will break bread together, spend time in prayer for one another, and dive deeper into the Word. Our ultimate goal is to plant another church. We long for the city of Craiova to know and worship Jesus as King. If you are interested in partnering with us, we are in need of prayer, monthly support, and long-term missionaries. God is providing exciting opportunities in this beautiful city, and we need people willing to commit their time and resources to make this vision a reality. We are in the process of recruiting and hope to have both monthly and long-term partners. Will you work with us to see this generation of future leaders impacted and changed by the gospel? Your decision to engage your passion here could make waves not only in Craiova but throughout the world. So please prayerfully consider joining us.